Well, we have had a fabulous day out today. It didn’t look promising this morning. T had a full blown sobfest when we mentioned that we were going to a museum (he loves museums, he just wanted to go to our local one…). He was also upset that it wasn’t yet Halloween, another full week to wait for that one mister… Anyway, all of that commotion aside, we set off on a journey down the motorway, to Halifax, home of Eureka, the national children’s museum. T had never been, E last came on a school trip a couple of years ago. We were directed to the disabled parking, and found it was free for blue badge holders (yay!). We joined the queue to pay, which didn’t take too long to go down. Admission price paid (essential carers get free admission), we hired a set of ear defenders for the day for E, which T immediately requisitioned for himself and then we started our visit. We entered the Soundscape zone, where several individual sound stations were located, all wheelchair accessible. Everything had lots of buttons, nearly all of these buttons made a noise or lit up lights, E was in a very happy place indeed. The more popular machines were impossible to get close to, it was half term, it was full of exuberant kids, we did come back later in the day when it had calmed down a touch and got to have a full, proper explore. A small walk away, we explored the water fountain, and found a hurricane simulator. Well we couldn’t turn down that opportunity, E LOVES the wind in her hair… Col and T chickened out, we ventured in. I was quite glad that I carried E in as in the end I used her as a wind shield, while she buried her head into my shoulder and giggled… Out we tumbled, looking flustered! Then we sent the kids to work. Time was spent on the tills in the shop, then around to the cars and mechanics department where T took the wheel off a car and E did a bit of driving. Into the bank where T used the CCTV cameras to search for the rest of us. All good fun, but the most important thing was that E was able to participate too, it might have been in her own way, but there was no obstacles in getting her wheelchair into the places we wanted, and that included the cars on this particular floor. Round to the cafe for dinner, and then to the Changing Places toilet, with adult changing bench and hoist, to get E sorted. These type of facilities are extremely rare in our public places, but they are the only type of loo where E can be sorted with dignity (so Thank You, Eureka, for including one). Further down the corridor there was a craft session on, we didn’t actually get involved with that but they had rugs on the floor and treasure baskets so it was an opportune moment to give E some rollaround time out of her wheelchair before moving on again. Into the bedroom, into the sensory tunnel, stars on one wall and an infinity mirror on another. Very, dark, I initially thought that T would refuse to go through, but then he made us go through about 5 times. Stopping only to play by a huge water tray. E could access this too, and enjoyed splashing, and it was a good 5-10 minutes before she leaned far enough over to get her face into the water (it’s an E thing…), at that point I quickly moved her away and showed her water where she couldn’t actually get access to it at a “how your toilet works” exhibit. Back along the corridor to the Spark Gallery. Again very dark, but lots of interactive light and art things going on, E was in her element again. Back to the lift, past a bat on stilts (yes, you did read that right, lots of Halloweenie stuff going on too this week…). Downstairs, in time for a bit of a monster show at the theatre. A gunky, gross exploration of the skeletal, cardiovascular and gastric systems done in a way that the kids loved. First point to note was that it was VERY busy, and therefore VERY loud. Sometimes this bothers E, sometimes it doesn’t. Today she was mostly OK and I think that was mostly due to the fact that she was kept occupied for so much of the day. Ear defenders are available and it did get quieter as the afternoon wore on. We were able to access everything, it really was one of the most inclusive venues that we’ve ever been to. Thank you Eureka, we will be back! Remembering taking our kids to Eureka a few years ago now & they loved it too. I suspect it’s been updated since we went but glad to hear it’s still a good day out. I’m the Inclusion Manager at Eureka! and just found this blog you wrote at the back end of last year. I’m so pleased that you found the museum accessible, and that you,Flossie and Ben enjoyed your visit. You might like to check out our Super Sunday and Holiday Arts clubs for disabled children on the website too. Either way, hope to see you again soon! We will definitely be back, the kids loved it. 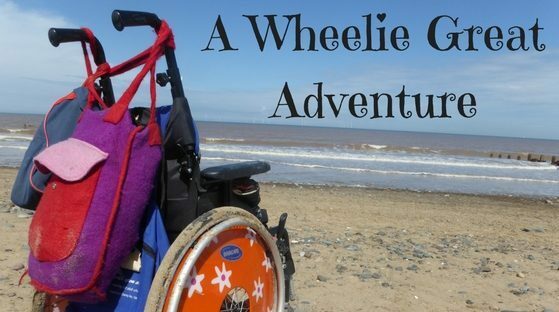 It’s probably the only place we’ve ever been where Flossie has been able to access EVERYTHING in her wheelchair, so Thank you for being so fabulous!